This easy to use cookbook has soups for every occasion. We personally refer back to it time and time again in our own kitchens. We wanted to capture the essence of soup. The cookbook is warm, inviting and easy to use, in keeping with the tone of the writing and with the notion of soup as a comfort food. 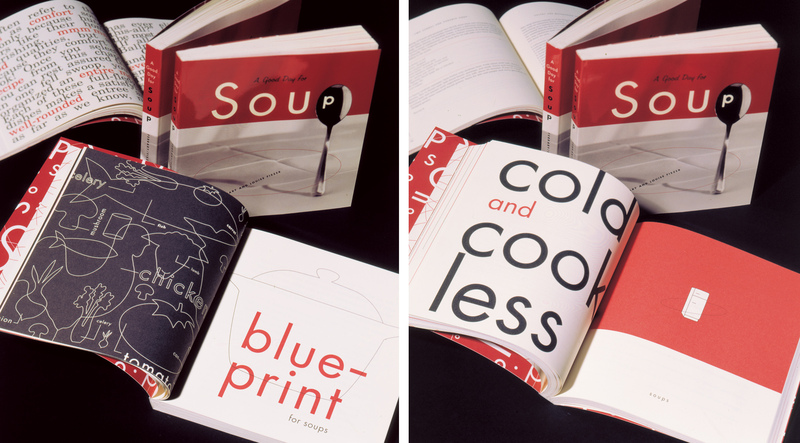 The tomato red color band and script type on the cover hints at a famous soup icon and makes the book easily identifiable from across the store. The playfulness is kept to the less-essential divider and intro pages so that the recipe pages remain easy to read and use. We found out years later that the cover created quite a stir at the publisher because it didn’t show any food on the cover, but it continues to be a good seller.